We left you yesterday with the exhortation, "There oughta be a law!," and we open with the same plea as we present today's article by Robert Sobel at the Examiner.com, "The GOP's 'Trickle Down' Economy Has Destroyed The American Middle Class," followed by his companion article, "Exposed! 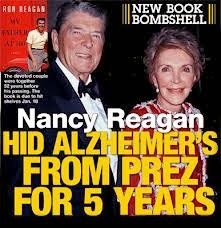 : Digging Deep Into The GOP Lies About Ronald Reagan And Social Security." "The American economy is improving, but not moving along fast enough for the American people. While the stock market has reached record highs and a budget surplus projected to fall to a five year low, low and middle income Americans are still not feeling the progress. "With an unemployment rate at its lowest levels in four years, more Americans are finding their way back to work, but the quality of work they are finding is not promising. According to economists at the Royal Bank of Scotland, a new study found that half of the jobs created in the United States since 2010 were 'low paying' jobs. The study defines low paying jobs as paying 80 percent or less what the average private sector worker makes, $20.04/hr. For sake of the survey, half the jobs created in the last three years paid their employees $16/hr or less. "Republicans and Democrats in Washington and around the water cooler often point blame at each other, but to find the real seed of economic destruction, you need to look back in history over thirty years ago. 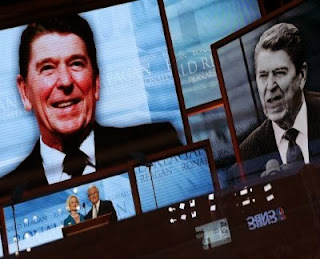 "When Reagan came into office in 1980, the top tax rate was 70%. 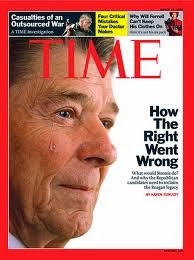 After his first term, the top tax rate had been cut to 50% and by the time he left office in January of 1989, the top tax rate was down to only 28%. Revenue into the federal government was cut so significantly, basic programs could no longer be funded. Even with less money for the country to spend, Reagan decided to increase military spending. In projected 2005 dollars, defense spending hit $456.5 billion by 1987, compared to only $325.1 billion in 1980, the year Reagan was elected. "While Reagan cut taxes drastically on the top income earners, the wealth didn't 'trickle down' like Republicans had promised. 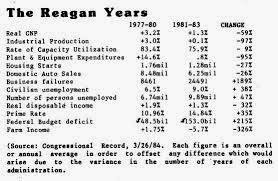 In 1981, Ronald Reagan signed into law the Economic Recovery Actwhich was said to reduce revenues by $749 billion over the next five years. After Reagan signed the massive tax cut, unemployment began to increase. 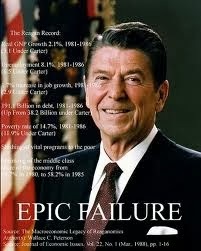 In 1982, Reagan needed to gain additional revenue and signed the largest tax increase in American history, the Tax Equity and Fiscal Responsibility Act of 1982. As 1982 came to the close, November and December shared an unemployment rate of 10.8%, the highest unemployment since 1948. 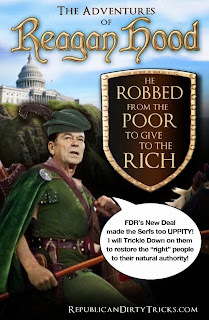 "Ronald Reagan raised taxes 11 times, primarily on the middle class, and under the advice of the Chairman of the Federal reserve, Alan Greenspan, Reagan increased the Social Security tax rate and added a gas tax. By the time Reagan left office he had tripled the national debt and left his Vice President, George H.W Bush, to handle the economic mess himself when he took over the presidency in 1989. George H.W Bush ran on the campaign message of , 'read my lips, no new taxes,' but with the large debt at his feet, he was forced to renege on his promise and raised taxes. "Republicans were furious with Bush and in the 1992 election, he lost to Democratic challenger, Bill Clinton. After eight years in office, President Clinton was able to get the United States fiscal problems under control and handed George W. Bush a surplus when he became president after a controversial defeat of Al Gore in 2000. With a surplus in hand, President Bush decided to cut taxes not once, but twice in 2001 and 2003. As with Reagan, the tax cuts primarily helped the wealthy and did very little for working Americans and small businesses. "In addition to big spending projects like the wars in Iraq and Afghanistan and passing an unpaid for prescription drug plan, President Bush was also close with the man appointed by Ronald Reagan as the Chairman of the Federal Reserve, Alan Greenspan. Greenspan had been a driving force in helping to deregulate the banks in the United States and mortgages were being offered to Americans who weren't in the position to take them on. Greenspan championed the 'sub prime' mortgage, which let low and middle income Americans seem like they could afford a home because of the low rates, but as the years went on the rates would rise, leaving the homeowner without the ability to pay. 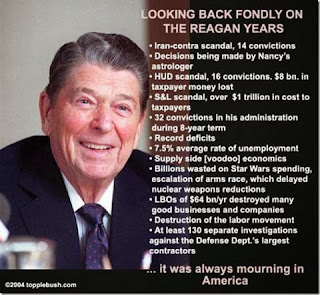 "While the Republican party has changed over the years, conservatives from Reagan to Bush do have things in common. The attack on unions started under Ronald Reagan when the Professional Air Traffic Controllers Organization (PATCO) went on strike demanding better working conditions, better pay and a 32 hour workweek. Union members also didn't want to be included in the civil service clause which banned government unions from going on strike. After calling their bluff, Reagan fired 11,345 workers who refused to return to work and sparked an attack on unions that continue to this day. As union membership has declined, income for working Americans, union and non union, has declined. Conservatives have molded the word 'union' into a four letter word, turning low and middle class workers against each other as the wealth has continued to concentrate to the top. "With union membership in decline, American workers have seen their jobs being outsourced to other countries. Companies decided that to maximize profit they would buy cheap labor in third world countries instead of paying hard working Americans a fair wage. On his last day in office, President Hover passed the 'Buy American Act' in 1933 which required the United States government to buy American made products, but left it too vague and gave the ability to hand out wavers to businesses. Starting in the 1980s, waivers were being handed out at a faster pace, continuing the attack on the American worker by utilizing cheap labor outside of the country. "The Republican party has created a 'battle royal' economy with 'battle royal' economics, where every man and woman is fighting for themselves. As the top 1% has seen their income increase sharply over the last thirty years, the average American has seen their wages remain stagnant. The American people need to stop fighting among themselves and fight for the rights guaranteed to them under the United States Constitution by our Founding Fathers." "'Ponzi scheme! ', 'bankrupt', 'liberal conspiracy'. These are terms you often hear from the Republication party and radical conservatives when describing the Social Security program. The issue with those terms is that they're all false. Whether it's your conservative uncle around the dinner table, conservative mouth pieces like Rush Limbaugh or the Tea Party members of congress, these flat-out lies are being told across the country. "Social Security is important in people's lives, especially retirees who rely on these benefits. Social Security is not part of the budget and doesn't contribute one nickel to the national debt. Social Security is part of a payroll tax, which is 100% solvent until the year 2038, and can pay out over 80% of the benefits until 2085. Social Security, from its creation under one of our countries greatest presidents Franklin Delano Roosevelt, has been one of the most successful programs the government has ever provided its people. "While Social Security is solvent for the short-term, there are long-term issues with the program that stem from situations that occurred over thirty years ago. In the 1980s, Republican President Ronald Reagan cut tax rates drastically. In 1980 the top tax rate was 70%, which was cut to 50% by 1984 and finally down to 28% by the time Reagan left office in 1988. 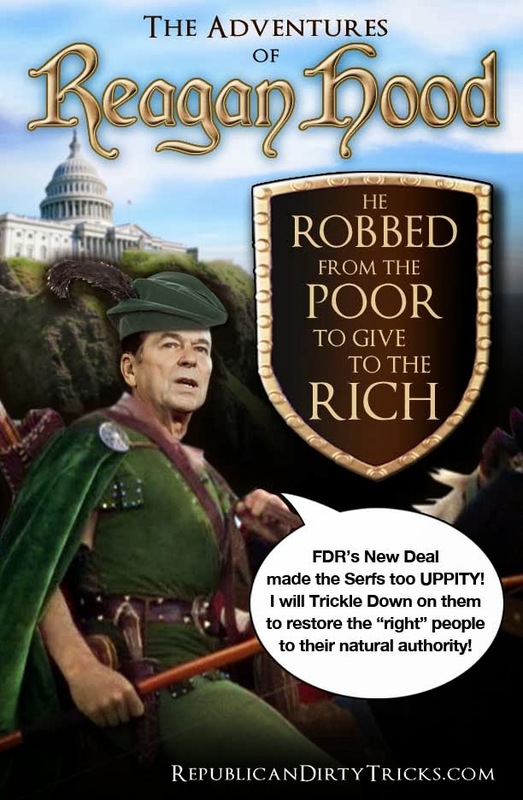 Supply side economics, or 'Reaganomics,' was the economic system that Reagan used and was the idea that giving wealthy Americans more money would create jobs which would then 'trickle down' to other Americans. "The supply side theory didn't exactly work as planned and Reagan needed a way to make up for the loss in revenue. Reagan ended up tripling the debt while congress raised the debt limit 18 times during his presidency without hesitation. With the lack of revenue coming into the government, Reagan needed a way to keep his fiscal house in order. In addition to raising the debt limit, Reagan also raised taxes multiple times and he did it on the middle class by attacking Social Security. "In 1987, Ronald Reagan appointed veteran business man Alan Greenspan to become Chairman of the Federal Reserve. Before he stepped into his new job, Greenspan already had a big impact on American economics . Under the advice of Greenspan, Reagan took money from the Social Security trust fund to help pay down the debt. The payroll tax was raised in 1983, and the government spent the surplus of Social Security each year to help pay down the giant debt that Reagan created by giving the wealthiest Americans more money each year with the promise of 'job creation' for the middle class. "When Republications scream about 'big government spending' today, they fail to mention that their party was a major reason behind our debt getting out of control. When it comes to Social Security, we need toeliminate the "cap" that is on the program, which is currently set at $110,100. Anyone who makes more than $110,100 doesn't get taxed for Social Security on their additional income. A person making a million dollars is only paying into the Social Security system about 10% of their income, compared to someone making $50,000 a year who is taxed for Social Security on 100% of their income. Shared sacrifice? Not so much. "The 'golden child' of the Republican party, Ronald Reagan, was the man who started the problems for Social Security and conservatives have been scaring the American people, especially the elderly, ever since. With current Republicans wanting to privatize Social Security, seniors would have to gamble and put their retirement years in the hands of Wall Street. Social Security is solvent, but we wouldn't even be having the discussion about its future if it wasn't for Ronald Reagan and those who follow in his footsteps." If you're interested in more articles about the vicious, mean old man called "Ronnie," just enter "Reagan" in the search box on the top left of the site...if you qualify as a "Reagan Democrat," you'll be in for a surprise.